The Chisholm Trail Ride with us! 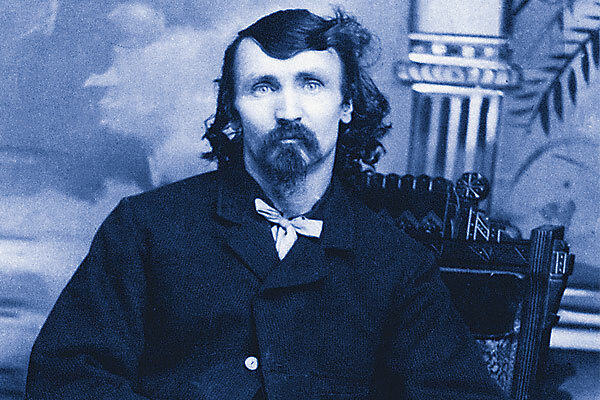 In 1867, cattle-shipping entrepreneur Joseph G. McCoy of the McCoy Brothers of Springfield, Illinois, went to Kansas to find a town on the Kansas Pacific Railroad and discovered the village of Abilene, on the western edge of the state’s farm settlements. With permission from the state governor, McCoy built chutes and stockyards next to the rail line in the town, and soon Texas cattlemen were driving their longhorn herds to Abilene. The Texas cattle-trailing industry lasted only fifty years. From Texas statehood in 1846 until 1897, Texas drovers trailed over 12 million longhorns out of their state to mining camps, to Confederate enclaves, to railheads, to northern ranches and to Indian agencies. Of the various trails used by the drovers, the Chisholm Trail remains the most famous. Created after the Civil War to supply the northeast with badly needed beef, the trail began as drovers followed a pre-war existing cattle pathway in Texas, ventured across Indian Territory using Jesse Chisholm’s wagon road, and continued north to Kansas’s depots. This pathway that carried over four million longhorns to the Kansas railheads, and later to Caldwell on the border, became known as the Chisholm Trail. 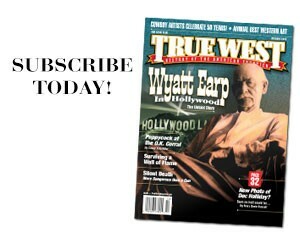 Ride with us as True West celebrates the Chisholm Trail’s 150th anniversary. We’ll point you to the cattle towns where you can walk the streets that the trail cowboys walked and visit other sites of interest where you can experience a historical cattle-trail adventure. From the southern triangle of Texas, trail drivers trailed herds numbering 2,500 longhorns each to the terminals of Kansas. The heaviest population of longhorns lived in the southern triangle of Texas, south of San Antonio. 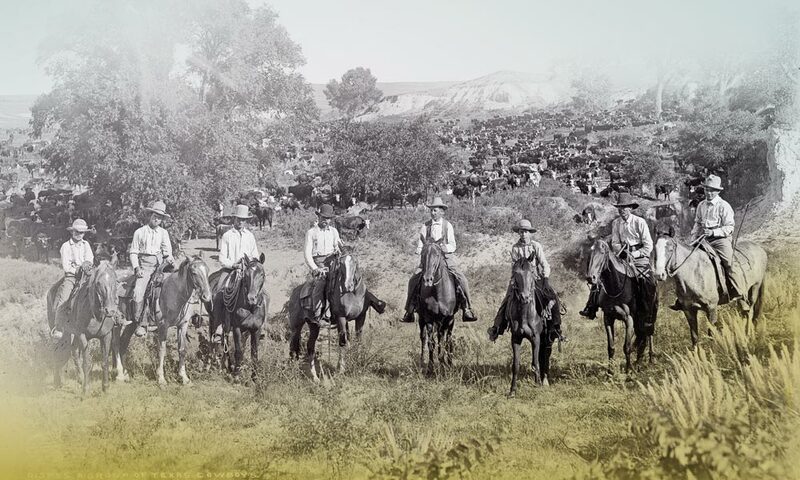 In early spring, cowboys gathered the wild animals, bunched them into herds, branded the longhorns and prepared them for the trail to Kansas, a trip of 900 miles that, at 12 to 15 miles a day, would take two or three months. Most of the Texas cattlemen who drove their herds of longhorns up from south Texas and the Gulf Coast would trail to San Antonio, possibly resupplying in the city’s Military Plaza commercial district (left). For four decades the historic city was the key staging area for trail bosses before heading their herds north to Kansas. Drovers trailed their herds over various feeder routes from the southern Texas triangle into San Antonio. There, as the herds grazed in the area, trail bosses and contractors prepared for the journey north, acquiring supplies and hiring trail hands. Through four decades, the city remained a staging area for drovers on the Shawnee, Chisholm and Western trails. 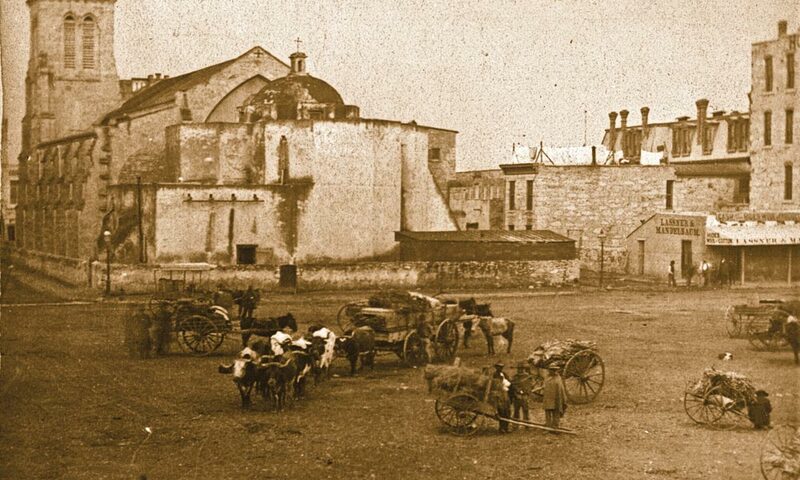 A San Antonio visitor can walk upon streets that the trail cowboys walked while visiting the Alamo, the 1859 Victorian-era Menger Hotel and the 1881 Buckhorn Saloon and Museum. To learn about the area’s history, a visit to the Witte Museum is a must. Capt. Richard King and Texas Ranger Capt. Gideon K. Lewis set up a cow camp on Santa Gertrudis Creek in 1852. Eventually the Running W-King Ranch encompassed 825,000 acres and became one of the most influential ranches in Texas. Located on a major feeder route to the Shawnee Trail, the King Ranch was among the earliest ranches to send longhorns to Missouri river towns. Through the years, King’s herds supplied northern outlets, as well, via the Chisholm and Western trails. The ranch, a National Historic Landmark, offers daily tours featuring the history of the ranch and its operations. Visitors can access the ranch from State Highway 141 West in Kingsville. Also visit the King Ranch Museum in downtown Kingsville. 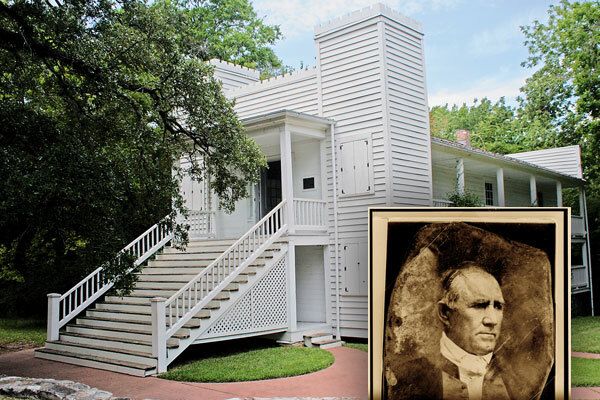 This Brownsville museum, named after Charles Stillman, the founder of Brownsville, is open for tours. Also visit the Historic Brownsville Museum in the old Southern Pacific Railroad Depot to learn more about the city’s rich military and ranching history. Learn about the American cowboy in the area and about the longhorn cattle and mustangs that were part of the trailing industry. This capital city that sits on the Chisholm Trail started from the tiny settlement of Waterloo, which in 1839 was selected to be the capital of the new Republic of Texas. Renamed for “the father of Texas,” Stephen F. Austin, its grand capitol building was being built in the mid-1880s while cowboys trailed their herds up the trail toward Kansas. Visit the grounds and sites that were prominent during the trail-driving days including The Governor’s Mansion, occupied since 1856,The Driskill Hotel, built by cattleman Jesse L. Driskill in 1886, and The Texas State Capitol Complex. Also, don’t miss the Bullock Texas State History Museum’s outstanding exhibits and art collection. At Waco, the trail split. The older established Shawnee Trail toward Missouri and eastern Kansas pointed to Dallas, while the new trail of 1867 toward Abilene, Kansas, headed northwest to Fort Worth. The challenge, however, was the crossing of the Brazos River with a herd of longhorns. 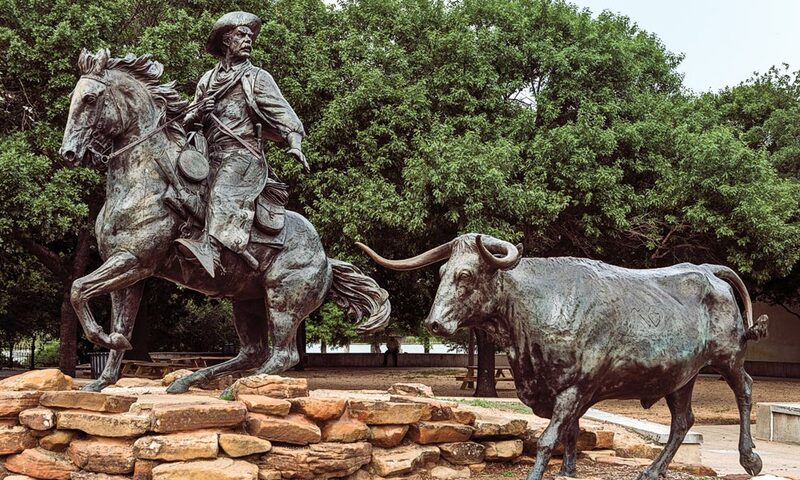 In Indian Springs Park on the west side of the historic 1870 Waco Suspension Bridge over the Brazos River, the city has honored the history of the Shawnee, Chisholm and Western trails with Robert Summers’s Branding the Brazos bronze statues of a trail boss, longhorns and a vaquero. In Indian Springs Park, walk across the old bridge which during the trail days provided a way across the unruly Brazos River for cowboys, their wagons and herds. While in Waco, one must see this outstanding museum with one of the best gun collections in the West. In 1849, an army post, Camp Worth, was established along the banks of the Clear Fork of the Trinity River. During the times of the cattle drives, Fort Worth was a rough-and-tumble frontier town of soldiers, frontiersmen and cowboys. The Texas & Pacific built into Forth Worth in 1876 which led to the building of the Union Stockyards in 1887. While in Fort Worth, one must see the most famous district in Texas. Wear your boots and cowboy hat and walk the boardwalk.The longhorns trail through daily. This oldest town in Montague County, was established in 1856 along the headwaters of the Elm Fork of the Trinity River. Thus it was originally named “Head of Elm.” The settlement catered to the cowboys on the trail who were heading for the Red River Station crossing. This first permanent structure in Saint Jo was built in 1873 in order to serve trail cowboys a drink and provide rest. Now a museum, stop by for a visit and order a sarsaparilla. 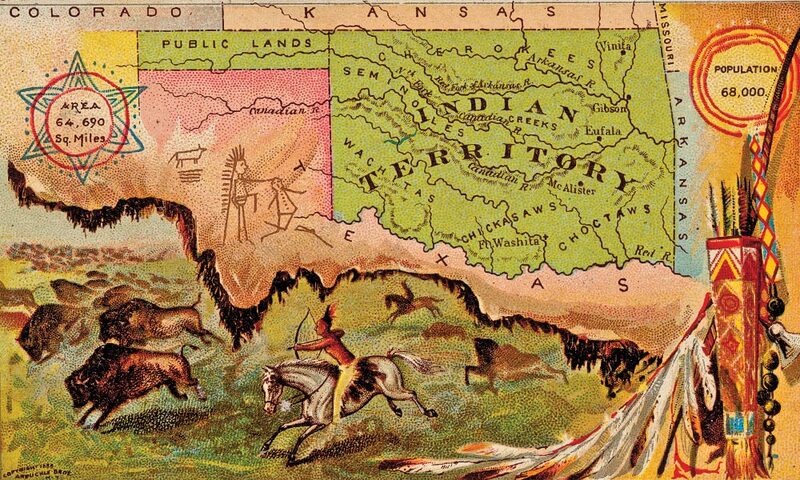 North of the Red River between Texas and Kansas lay the Indian Nations. Drovers with their herds moved from trading post to trading post across the Indian Territory. Young Texas cowboys felt uneasy after crossing the Red River out of Texas. They were now in the Indian Nations and did not know what to expect. In order for Kansas interests to stay connected with Fort Sill and Fort Reno in Indian Territory, road ranches or stations were built along a pathway between the forts and Caldwell and Arkansas City, Kansas. Passengers in stagecoaches, military personnel and cowboys from off of the nearby Chisholm Trail visited these frontier outposts for a change of horses, for refreshments and for rest and conversation. Today U.S. Highway 81 closely follows this pathway. Texas cattlemen followed the Shawnee Cattle Trail, Shawnee-Arbuckle Trail and the Fort Belknap-Fort Arbuckle Military Road across the Red River to cross the Indian Territory to the railheads in the Kansas cowtowns. The natural crossing of the Red River had been used for decades by the local Indians before a frontier trading post was built. Its owner supplied refreshments and rest to the soldiers on the Fort Belknap-Fort Arbuckle Military Road. When cowboys with their herds started using the crossing, a small community developed. There is nothing there today. The army played a key role in the trail drives across Indian Territory. 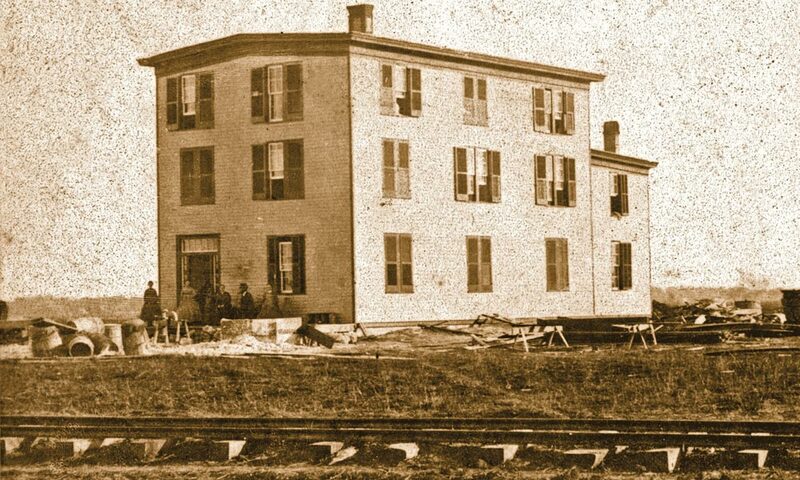 The Red River Station Crossing, first used on the Fort Belknap-Fort Arbuckle Trail between 1851 and 1867, was re-established as the primary crossing of the Red River in 1870, when Fort Sill was built on the western frontier of Indian Territory, and Fort Arbuckle was closed. While not founded until 1892, after the Chisholm Trail days, today it’s a good place to stop while following the trail north to Kansas. Shannon Springs Park, they say, was a watering spot for the cattle and cowboys on the Chisholm Trail. The small frontier store and stage station on Cow Creek in the Chickasaw Nation originally served Indians and soldiers on the east-west Fort Sill-Fort Arbuckle Military Road. After drovers started north with their large Texas herds, William Duncan purchased the property, expanded the store and laid out the town of Duncan. Located 44 miles north of the Red River, Duncan’s Store became an important stopping point on the Chisholm Trail. April 1: Cowboy Camp with historical re-enactors; April 8: Chisholm Trail 150 Celebration Gala; July 25: National Day of the Cowboy; November 17: Campfires, Cattle and Cowboys Gathering. In 1870, Brinton Darlington established an agency on the newly created Cheyenne and Arapaho Indian Reservation on the north side of the Canadian River. Texas drovers delivered herds to the agency to feed the Indians. In 1874, a military encampment was built near the issue pens. The camp became Fort Reno. For history buffs, a trip to Fort Reno is a must. Visitors will learn about the military involvement in this part of Indian Territory during the Chisholm Trail era. We especially recommend each month’s third Saturday night cemetery tour when ghosts of Fort Reno tell their stories. King Fisher Stage Station, a frontier abode located on Kingfisher Creek in the Unassigned Lands of Indian Territory, catered to the Chisholm Trail cowboys. Located directly on the trade route of the Chisholm Trail, this museum boasts a frontier village and the Gov. Abraham J. Seay’s mansion. Learn more about the Chisholm Trail at this outstanding museum. In 1872, William Lee and Albert Reynolds located the Red Fork Ranch & Stage Station trading post north of the crossing of the Cimarron River. Because in 1872 the river was known as the Red Fork of the Arkansas River, the owners named their post Red Fork. The Jesse Chisholm Wagon Road and the Abilene (Chisholm) Trail converged just south of the Cimarron River crossing. Skeleton Ranch Stage Station, a frontier post on Skeleton Creek, provided refreshment and rest. The center in Enid will host an official Chisholm Trail 150 Kickoff Event on April 1, 2017. Its Summer Chautauqua, scheduled for June 13-17, is themed The Great West: Cowboy & Cattle Trails. In the late 1860s, the Sewell Stockade was built on the crossroads of the Chisholm Trail and the Black Dog Osage Indian Trail. The spot later became known as Pond Creek Ranch. A genuine longhorn drive by cowboys will commence at Pond Creek and continue to Caldwell, Kansas, camping along the way. For exact dates and details, check the official website. After the Civil War, Kansas was the destination for herds of Texas longhorns. Following the disappointing 1866 season, Texas cattle drovers faced an uncertain future. The cattle-trailing industry had faltered. In June of 1867, 29-year-old Joseph G. McCoy represented the McCoy Brothers, an Illinois stock-shipping firm, and stepped off the Union Pacific Eastern Division train. Knowing the dire situation, he was determined to locate a cattle town somewhere along the last fifty miles of freshly laid tracks. He chose Abilene. Enterprising Illinois cattle trader Joseph G. McCoy advertised his Abilene stockyards and Drovers Cottage in Texas newspapers to attract cattlemen and their herds to the Kansas railhead. This border town that sits one mile north of the Indian Territory (Oklahoma) line, was established astride the then new Chisholm Trail in 1871. Because of the 1875 Kansas cattle quarantine, the eastern Kansas railheads were shut down, until the AT&SF Railway reached Caldwell in 1880. The Border Queen opened up the Chisholm Trail again in Indian Territory and became one of the most important railheads for cattle until the unassigned lands south of Caldwell opened up in the famous Land Run of 1889. Caldwell’s three-day event from May 5-7, will feature various activities in celebration of the Chisholm Trail. Be sure to visit the Opera House shows, each of the three museums and view the 11 historic markers throughout town. Surveyed and developed in 1871-’72 during the peak of the Chisholm Trail era, Wellington, located seven miles east of the trail, traded with the drovers and became part of the trail’s history. 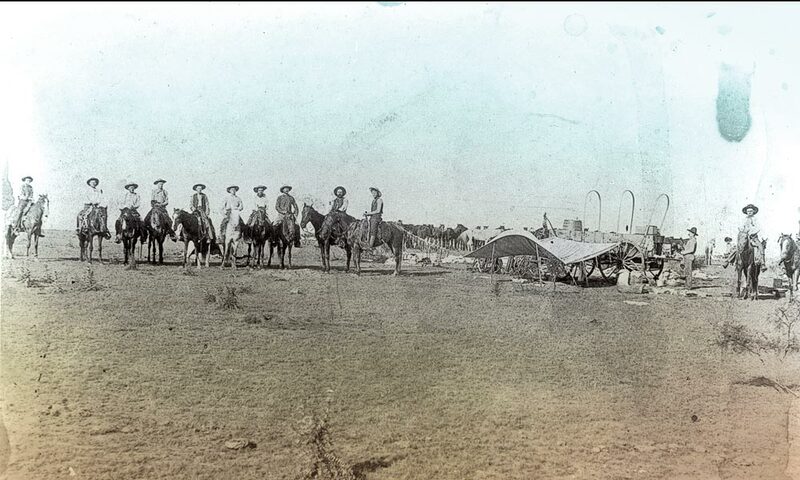 In 1871, cowboys abandoned Abilene and turned their herds to Ellsworth or Newton. 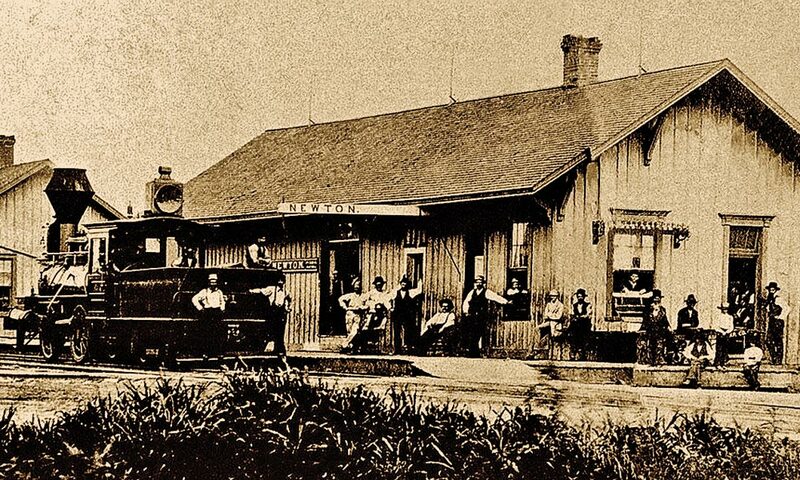 To reach Ellsworth, drovers created a more westerly branch starting at Pond Creek Station. Visit both towns’ various events to learn why each one claims to have been the most wicked and bloody cattle town in Kansas. Oh, the tales each one can tell! Delano sprang up during the Chisholm Trail days as a neighborhood on the other side of the river from respected Wichita folks. Here trail-weary cowboys could take their rest and recreation in the many saloons and brothels. Longhorns were trailed down Douglas Street on the Wichita side of the river to the holding pens. Learn more about this historically recognized neighborhood and the cattle town with its many activities throughout the year. From October 6-8, 2017, Delano will come alive with many family activities to celebrate the trail that brought the Texas cowboys into its neighborhood. Check the website for times and places for the cowboy parade, gunfights, re-enactments, food and games. “Come in period dress,” they suggest. Joseph McCoy described Abilene in the summer of 1867 as “a very small dead place consisting of about one dozen log huts.” Over the next three months, against all odds, he created a cattle terminal that became like no other before its time. Abilene will once again become the Cattle Capital of the World throughout 2017 with many events. Kicking off the celebration year on April 1, the town will host a symposium at the Eisenhower Presidential Museum, and on Labor Day Weekend its Trails, Rails and Tales 2017 event will take place. Award-winning Kansas authors Margaret and Gary Kraisinger have recently published their third book on Texas cattle trails, The Shawnee-Arbuckle Trail, 1867-1870, the Predecessor to the Chisholm Trail to Abilene. Following an American Patriot Heading down the Sam Houston trail from Virginia to Texas. A Feast Along the Alferd Packer Trail From Provo, Utah, to Denver, Colorado. 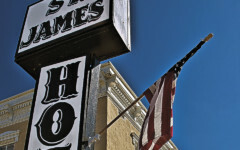 History, Heritage and Hospitality Go West and enjoy the best historic hotels, lodges and saloons.